I used to work in an Italian restaurant, so I’m no stranger to tiramisu. In fact, I’m no stranger to the good, the bad, and the ugly side of tiramisu. I became addicted to its layers of firm, creamy goodness at the restaurant, and have since been on a quest to try the dessert almost everywhere I go. When a sample of new Dove Desserts Tiramisu Silky Smooth Dark Chocolate Promises arrived on my doorstep, I was both excited and wary. I’ve been burned by bad tiramisu before, and couldn’t imagine how a candy company could properly imitate the good stuff in a tiny, foil-wrapped square. Sadly, I was right to be wary. The dark chocolate coating was sweet and tasty (although it seemed a bit milkier than dark), but the caramel-colored filling was chemically at best. There were vague hints of the essential elements of tiramisu, and the consistency was smooth, but I really felt like I was ingesting an artificial replica of tiramisu – and not a very good one. 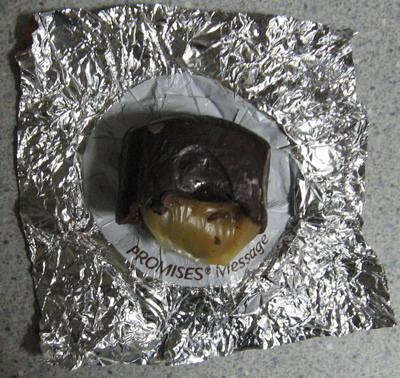 The individually-wrapped pieces, like many of Dove’s products, are convenient and fashionably packaged. Messages on the insides of each wrapper reveal pearls of wisdom (well, that’s probably a stretch) like “Remember your first everything.” What I remember is, after eating Dove’s candy version of tiramisu, I’m left with a serious craving for the real deal. I have the same tiramisu obsession.